Balls. BALLS. One simple, provocative word, yet strong enough to draw out scores of Test Kitchen aficionados last night. The faithful were hinging on that one suggestive utterance, but their confidence was rewarded with balls of meat--meatballs if you will--from none other than Chef Amy Pressman. 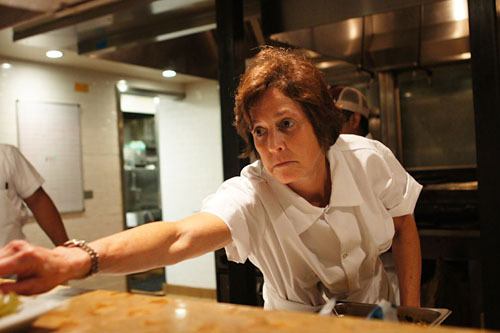 Pressman is perhaps best known for working alongside Nancy Silverton at Spago, and in fact, the Chef is partnering with Silverton (as well as Rivera's Bill Chait) for her new hamburger concept, Short Order, which is slated to debut later this year. 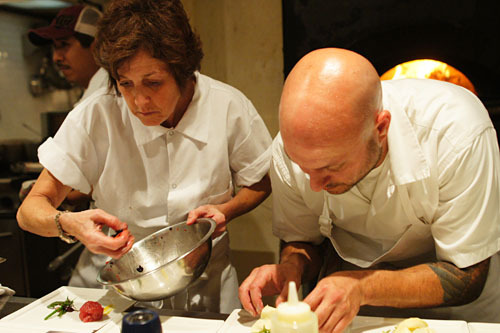 Pressman will be handling the menu for the most part, so it was fitting that she (and The Huntley's Seth Greenburg), and not Silverton, was behind the stoves tonight. The guest list tonight was extensive: Executive Chef Adam Horton and Pastry Chef Kasra Ajdari from Saddle Peak Lodge (who will be doing their own night here next week); Chef Akasha Richmond from her eponymous Akasha; Bill of Street Gourmet LA; Chef/Owner Eddie J. Caraeff from NewsRoom; the inimitable Chef Gino Angelini from Angelini Osteria; Jackie of A Peek into Citynitz's Sentiments; Golden State co-owner Jason Bernstein; Jo of My Last Bite; Mozza manager Kate Green; Lucy of Ladles and Jellyspoons; Max Sussman, one half of Freshman in the Kitchen; Nguyen and Thi Tran, the lovable duo behind Starry Kitchen; Ryan of Epicuryan; omnipresent food photog Ryan Tanaka; Chef Sergio Penuelas of Mariscos Chente fame; Stephanie of Stuffycheaks; Chef Suzanne Tracht from Jar; Tomoko of Tomostyle; longtime kevinEats reader Vince (whom I ran into in the bathroom at Hatchi); and lastly, a gaggle of chefs from XIV. 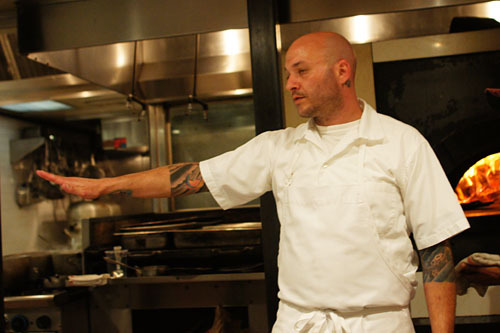 Previous Test Kitchen posts: Shelley Cooper (9/17), John Sedlar (9/15), Amanda Baumgarten-Dylan Hallas-Dan Moody (9/14), TiGeorges Laguerre (9/6), Vartan Abgaryan (9/4), Neal Fraser (8/31), Michael Voltaggio (8/29), Walter Manzke (8/25), Ricardo Zarate (8/24), Jordan Kahn (8/18). Pressman's eight-course, meatball tasting menu was featured at $50, with additional wine pairings by Therese Keating adding another $40 on top of that. As usual, cocktail duties were the charge of bartenders Joel Black and Julian Cox. Click for larger versions. 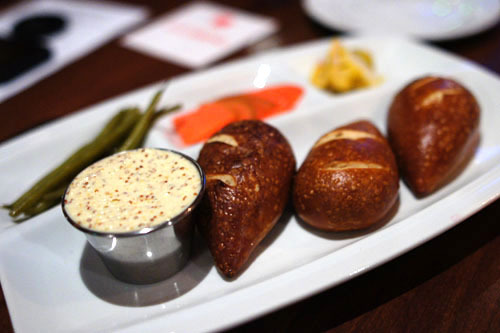 Fittingly, we began with bread, some rather cute pretzel rolls in fact. They were tasty enough alone, but the key here was the Dijon mustard butter, which had a mouth-puckering tang that cut right through the monolithicity of the bread. The pickles, meanwhile, added further points of palpable piquancy. Naturally, we went with a trio of cocktails to start. 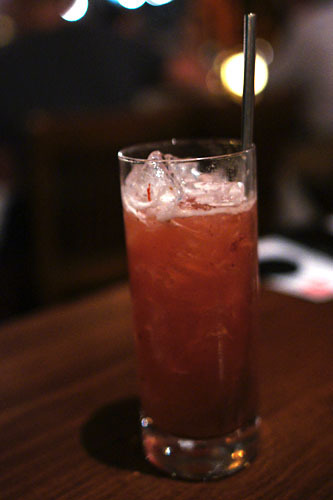 Our favorite of the bunch was the Strawberries on Fire (jalapeno infused gin, strawberry, lime, cane syrup), which showed off juicy notes of strawberry paired with a positively bracing, undeniably lingering jalapeno heat--potent stuff, that! 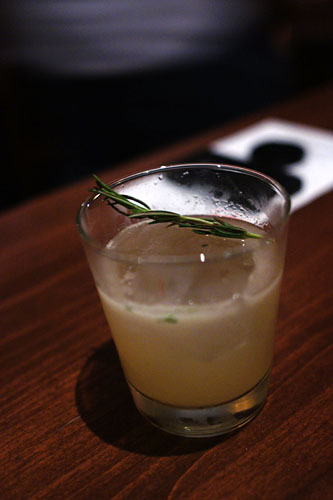 The Virginia Bootlegger (moonshine, fresh citrus, rosemary, red bell pepper) was also quite delish, with a sweet, citrus-y attack leading to a tasty, herbaceous body intertwined with the weight of moonshine. 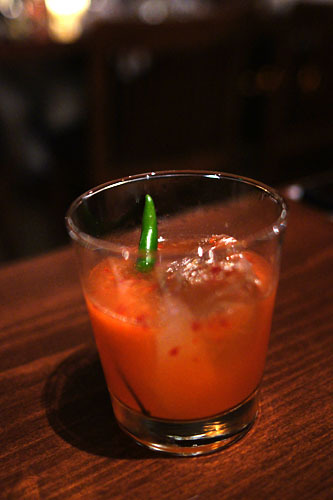 Rounding out the troika was the Fall Rangoon (pimm's no 1, seasonal fruit, lime, lemon, mint, canella syrup). 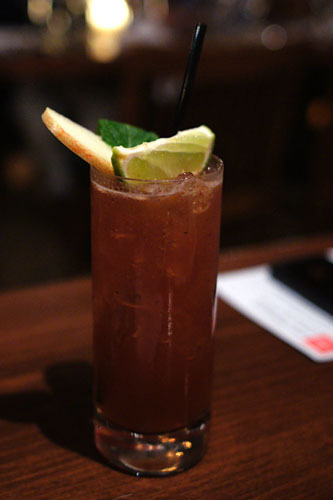 This one demonstrated green, refreshing, spicy fruit flavors with a pleasant effervescent tang; one of my dining companions even likened it to root beer! Next up, a salad or sorts, to whet our palates before the gauntlet of balled meat to follow. The tofu was surprisingly effective here, forming a mild base on which the succulent tomatoes, tangy basil, and bitter arugula could really sing. I quite liked the textural component provided by the yuba as well. 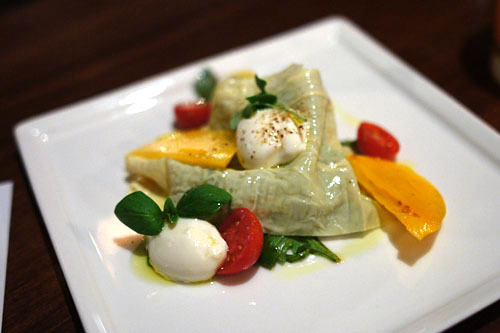 The overall effect was reminiscent of a classic insalata Caprese--nice! 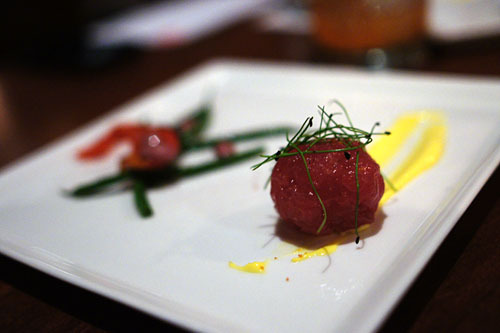 Tuna tartar in balled form--this was a first for me. The bigeye didn't have much zing of its own, so its topping of peppery microgreens was an apt accoutrement, as was the aioli. The crux of the dish, though, was the "salad" of haricot vert, beans, bell pepper, olive oil, and bottarga, which lent lovely hues of earthy, sour, and briny to the fish. Here we have my favorite course of the meal. 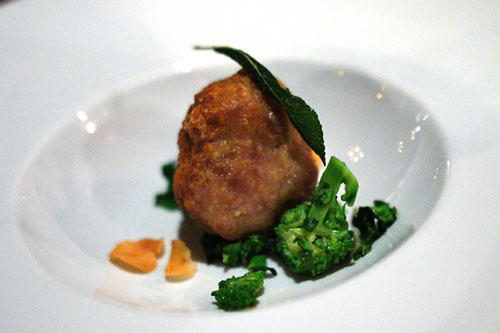 The turkey meatball was rather subtle vis-à-vis the duck, which I found more savory, more toothsome. Easily the best part of the dish, however, was the stuffing; imbued with the undeniable quintessence of truffle, it was the best version that I'd ever had, lending a lush, earthy note to the entire dish. This was then joined by the poached egg, with its gooey, runny, creamy goodness serving as an overarching factor integrating everything together. 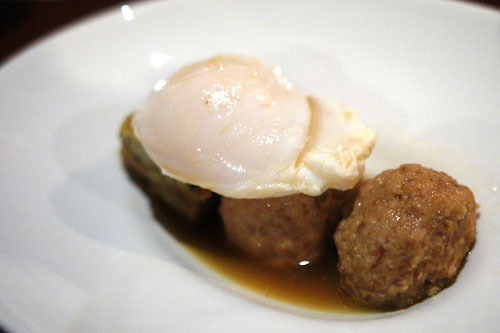 Interestingly, had there been a chicken meatball present, we could've had a sort of deconstructed turducken! Lamb, augmented by the power of a feta cheese stuffing, showed off its characteristically rich, luscious savor, which was superbly balanced by the tangy dollop of salsa verde dressing. The fregola, meanwhile, did a great job in tempering the gravity of the dish, and I appreciated the tinge of heat on the finish, courtesy of the harissa. Unfortunately, I found the lamb a bit dry, and would've much appreciated a more succulent meatball. 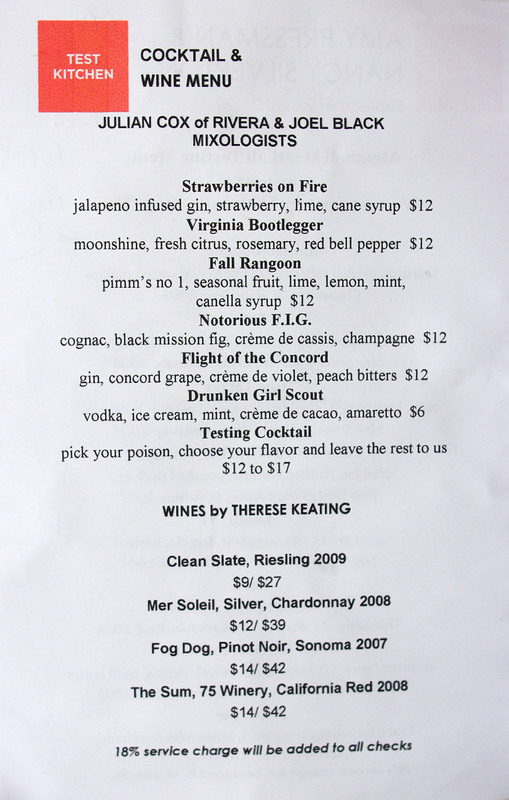 Next up in terms of cocktails was the Notorious F.I.G. 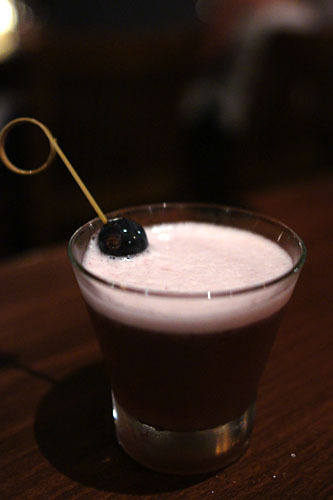 (cognac, black mission fig, creme de cassis, champagne), which put forth a saccharine, herbaceous tang that cut right through the potency of the brandy, all leading to a jammy sweet finish. It was almost medicinal in nature. 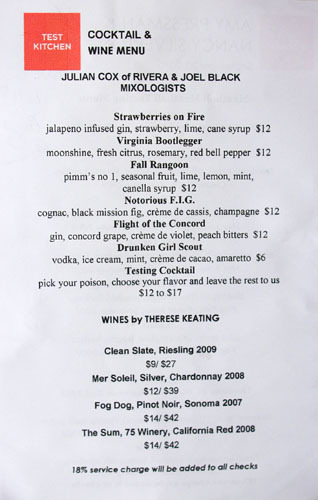 The Flight of the Concord (gin, concord grape, creme de violet, peach bitters), on the other hand, showed off overarching floral notes, backed by a load of boozy grape character. Next were pork balls with their heady, intoxicating aroma that got my mouth watering even while I was still busy snapping photos! Brazenly juicy and redolent of porcine sapor, the meatballs were delectable, yet so forcefully moderated by the unabashed bitterness of broccoli raab. I was somewhat fond of the sharp tang of the rapini, but it was arguably too astringent. 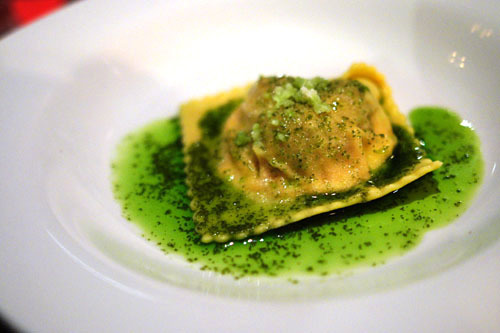 Our final savory course brought us a singular raviolo, stuffed with an amalgam of beef, tomato sauce, and ricotta cheese. The flavors were somewhat textbook, though they did meld together well. 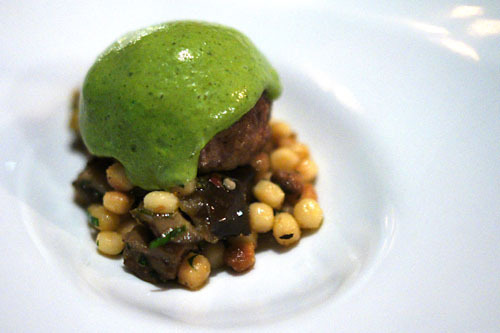 My favorite item here, though, was the basil butter, and how it lent a lightening, counterbalancing element to the dish. 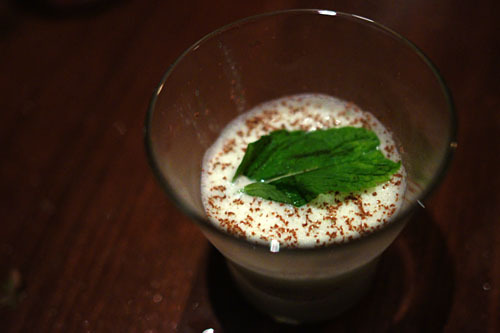 At this point, we were brought the Drunken Girl Scout (vodka, ice cream, mint, creme de cacao, amaretto), which Joel Black had created earlier to celebrate when Test Kitchen surpassed Urasawa as the most blogged-about restaurant on kevinEats. As before, the drink was mah-velous, drinking like a adult mint chocolate chip ice cream (or rather, Thin Mint). 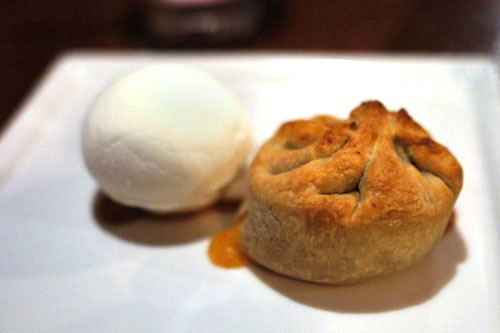 For our dessert course, Pressman seemed to have channeled the likes of Michael Voltaggio, presenting a nitro semifreddo to accompany her peach pie. The semifreddo had a delightfully frozen exterior, breaking apart nicely to reveal a creamy custard within. It actually had an almost savory tinge to it, and did well in balancing the jammy sugariness of the pie. Overall, a fun meal and a solid showing from Ms. Pressman. 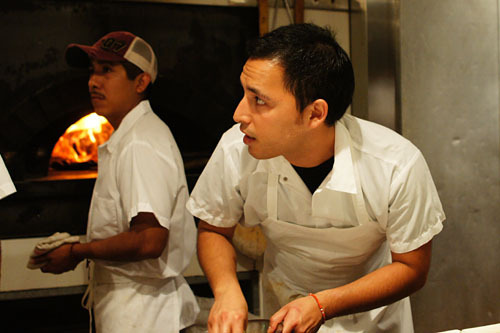 I was especially interested in the Chef's balls, which will, in some way or another, make their way into the meat patties to be served at Short Order. With a few minor tweaks, they should translate well, and I look forward to trying out her full-fledged burgers in the coming months! Wanted ten more pork balls! Kevin it was nice running into you guys. I am planning on attending one of Adam Hortons dinners but i havent decided which night. What I am really looking forward to is the American Food and Wine Festival this Saturday. It will be by 3rd year in a row and it is AMAZING. Will you be there? Vince: I'll be going to Adam's dinner on the 27th. I won't, however, be attending the AWFF on the 25th--too many festivals! Hey Kev: You should think about taking the top floor of the building as your Kevin Eats HQ. It will make things so much as easier than having to drive up every time to review. 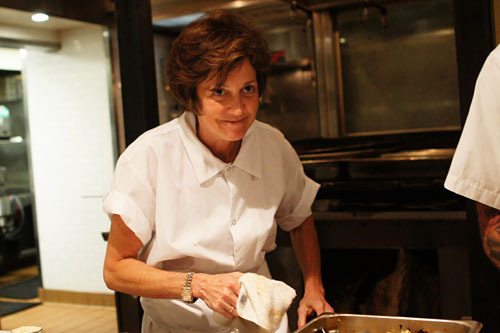 Anyway, the restaurant kept hinting that Nancy Silverton was going to be the one behind the stoves. 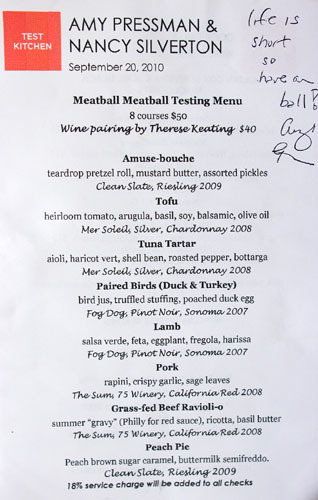 I have to say the "Balls" menu did not look like it really live up to expectations. Looks like it needs a lot more than a few tweaks before launch. But sounds like a fun inside foodie crowd. 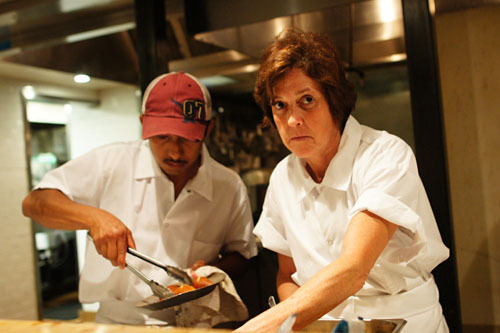 Evan: Yep, I agree about the Nancy Silverton hints--I really thought both of 'em were going to be cooking. Stephanie: I'll be at TK tomorrow as well, so I'll see you there! Menu looks very interesting--I mean, a chicken dessert?